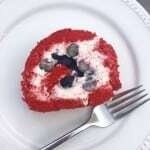 Try your hand at this gorgeous gluten free Red, White, and Blueberry Roulade! This Red, White, and Blueberry Cake Roll, from gluten-free baking superstar Kyra Bussanich, is sure to be the fabulous finale to your 4th of July celebration. For 5 year old me, the fun in the 4th of July wasn’t the fireworks (too loud). Nor was it the hot summer sun (our sprinkler was adequate at best). No, the fun for me was in eating all the red, white and blue treats! This cake roll (or roulade, in French) is super simple, and still captures the fun and whimsy that 5-year-old me would look for at the picnic table. The magic is really in letting the assembled roll chill in the fridge. This lets the vanilla flavor become more pronounced. It also makes it easier to cut the cake. When Stephanie Kralevich ,from KPTV’s “More Good Day Oregon”, asked me to come up with a recipe suitable for the 4th of July, I knew that this would be perfect. We had a blast making (and then eating) this Red, White, and Blueberry Cake Roll! Luckily, it’s super simple to make another! Recipe and article courtesy of Kyra Bussanich, 4x Cupcake Wars Winner, get Kyra’s Cookbook. A quick and easy cake roulade that would be perfect for your patriotic picnic! Spray a jelly roll pan with pan spray and line with parchment paper. Spray the parchment with pan spray and sprinkle 2-3 tablespoons of sugar over the parchment. Set the pan aside. Whip the eggs on high speed until they are super light and fluffy, and what drips from the beaters holds its shape for 3 seconds. This is called the ribbon stage. While the beaters are going, slowly add the sugar in a small stream. Turn the mixer speed to low and add in the flour in three additions. Add the baking powder, salt, and xanthan gum. Pour into prepared pan. Using a small offset spatula, gently rock the batter to the edges of the pan so that it's spread evenly to the corners. Be careful not to overwork the batter! The more gently you handle it, the more air bubbles you'll keep and the lighter and fluffier the cake will remain. Bake for 7-8 minutes until a toothpick inserted in the center comes out clean. Lay a large tea towel on a large, flat surface. Sometimes I double up the towels. Spread a piece of parchment over the towel. When the cake is finished baking, gently run a palette knife or baby offset spatula around the edges to release it from the pan. Sprinkle the top of the cake with a little bit of sugar to prevent it from sticking to the tea towel. Invert the cake over the parchment-lined tea towel. Remove the parchment that you baked the cake on, and immediately roll the cake width-wise so it remains as long as possible. Add the heavy whipping cream, powdered sugar, and vanilla bean paste, and whip until medium peaks form. When the cake is completely cool, gently unroll the tea towel and peel off the parchment paper. Spread the whipped cream evenly over the top of the cake. Be gentle, so as to not rip the cake. Starting with the part of the cake that is the most tightly rolled, spread the blueberries over the whipped cream. Concentrate them toward the part that will be the center of the roll. Re-roll the cake (use the parchment to help, if needed, but be sure to peel it away from the cake). Transfer the cake to a large platter and refrigerate until you're ready to serve it (at least 1 hour). If your cake cracks, or you just want to dress it up a little bit, dust the top with a little bit of powdered sugar. 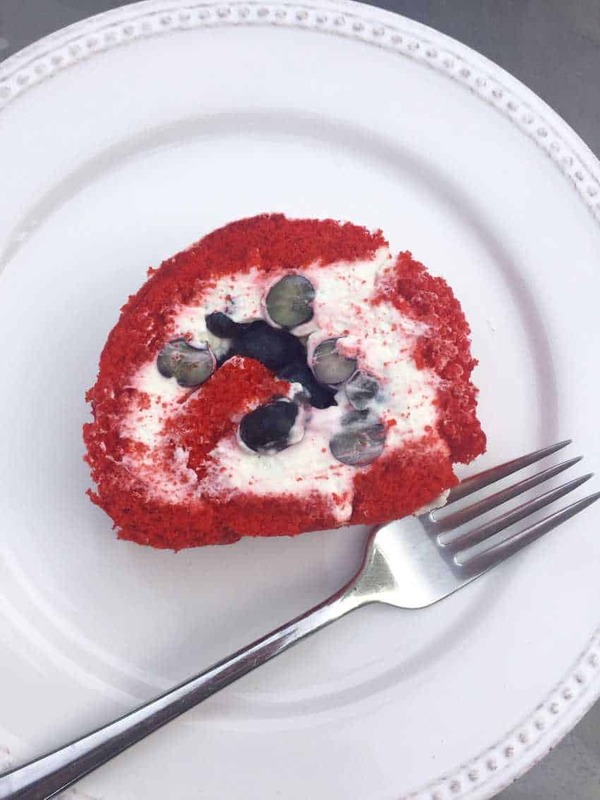 This entry was posted in Baked Goods, Desserts, Recipes and tagged 4th of july, blueberry cake, desserts, G-Free Foodie, gluten free, gluten free cake, gluten free cake roll, gluten free desserts, gluten free roulade, july fourth, Kyra Bussanich, red white and blueberry. Bookmark the permalink.